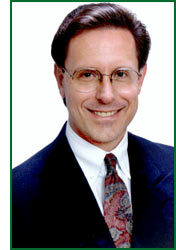 Dr. Vravicks’ goal as a periodontist, is to reestablish good oral health and then help his patients maintain it. He became a periodontist to improve the way patients and dentists view the Specialty of Periodontics and the importance of retaining your teeth throughout your life. Periodontics is the key to long term predictable dental health and health in general. Periodontal treatment, when performed by Dr. Vravick, does not have to be a bad experience. He has the communication skills necessary to educate his patients’ in an informative manner about the disease, alleviate their fear of treatment and set up the necessary treatment plan for that individual patient. Our result is a healthy mouth that can be maintained by regular cleaning appointments and home maintenance. Dr. Vravick always emphasizes conservative treatment, whenever possible. After your examination, you will have the necessary information to make the proper treatment decisions for you. We believe that a properly informed patient makes a good periodontal result possible. We use the most up to date equipment including a CO2 laser to minimize patient discomfort. In some cases, a surgical procedure can be performed without the use of a blade or stitch, using this laser. We also now have the ability to test a patient to see if he is genetically susceptible to future periodontal breakdown. DNA probes and culturing allow us to detect specific bacteria present in a periodontal pocket and if they will continue to destroy the gum and bone tissues. This can allow us to make the best treatment decisions for our patients. For your comfort, we offer nitrous oxide (laughing gas) along with other sedation options. Our staff will provide you with a warm and caring attitude that will help you through all stages of treatment. Dr. Vravick attends and gives regular continuing education courses each year to keep himself and other dentists up to date with the latest dental technology and diagnostic techniques.